Run time: 1 hr 25 min. Right now, traders are making money from stocks that repeatedly consolidate and then break out in explosive moves. With a list of the characteristics all big moves share in your hands, you can consistently grab nice juicy profits. In this brand new course, bestselling author Guy Cohen hands you this simple list, which will put you ahead of the markets and position you for windfall trades. Parameters for options trades that reduce risk and increase upside. In addition, this course gives you the exact specifications of consolidation patterns. These will spotlight massive upside trades as they build up power. Just think of what you can do when you see these huge moves BEFORE they break out. Are you looking for a way to make money easily, consistently, and efficiently? 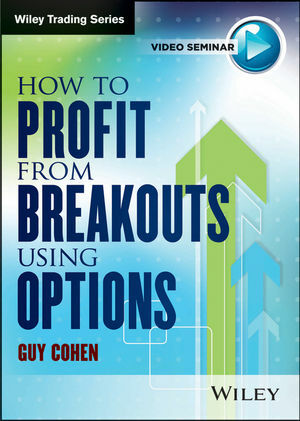 In this action-packed DVD, options expert Guy Cohen will teach you how to make a killing from stocks that are about to break out from consolidation patterns in the market. Watch and learn as Guy highlights the nuances of your optimum trading patterns and those you should avoid. Continuation Patterns With his straightforward approach, Guy will train you to recognize the signals and will teach you how to capitalize on each pattern. An innovator in financial trading, Guy Cohen is the creator and originator of the unique OVI Indicator, FlagTrader, and OptionEasy, among other trading tools. Guy is also an established bestselling author, commentator, and entertaining speaker on trading and the financial markets. Guy specializes in trading stocks and options, with his hallmark user-friendly approach and liberal use of illustrations. His published work is complemented by pioneering breakthroughs in the areas of trading and technical indicators, especially the OVI. With Guy's market-tested innovations, you will find proven techniques to succeed, complemented by industry-leading customer service. Guy earned an MBA in finance from Cass Business School, City University London.